The exhibition "The Pursued King. Michael I of Romania in the Files of the State Security Services. Constanţa: Open Education and the National Council for the Study of The Archives of the Securitate (state security services) announces the opening of the exhibition "The Pursued King. Michael I of Romania in the files of the state security services", which will take place on Friday, the 22nd of august 2014, at 11.00 a.m, in the National Museum of History and Archaeology in Constanta. The exhibition opening will be followed by a round table discussion on "August 23, 1944: 70 Years of Historiographical Controversy "; the debate will be held in the Auditorium Adrian Rădulescu of the Museum of National History and Archaeology in Constanta. The National Council for the Study of The Archives of the Securitate (state security services) announces the opening of the exhibition "The Pursued King. 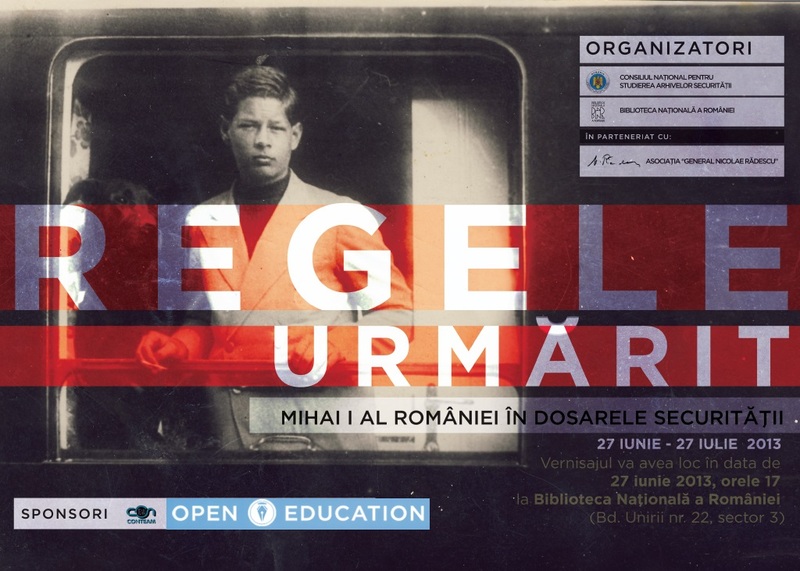 Michael I of Romania in the files of the state security services", which will be held on Thursday, June 27 2013, 17 p.m., in the central exhibition place in the new headquarters of the National Library of Romania (B-dul Unirii, no. 22, sector 3, Bucharest). The materials cover the period of exile, as his Majesty Michael I of Romania became the subject of the prosecution coordinated by the political police. Along the years, the state security called him "the Alien", "Leon" or "Rex", and the informative and operative surveillance measures undertaken against the Royal family were organized in an action called "The Crown". The exhibition The Pursued King. Michael I of Romania in the files of the state security services, conducted by the National Council for the Study of The Archives of the Securitate, includes documents issued by the political police throughout the exile informative monitoring of the Royal family (1948-1989), pictures (some of them unpublished, which were made available by the Royal House of Romania), press articles, etc. According to the specific directives, the documents issued by the "Securitate" are varied: action plans, directing the informers in an attempt to obtain data for compromising the Royal family, putting individuals or international institutions under pressure so that they no longer support the actions of his Majesty etc. In addition to the informative supervision, the exhibition presents the architecture of the compromising operations, the infiltration attempts of some informants near the Royal family and the boycott of the initiatives of his Majesty during the exile to gather around the Romanian patriots.